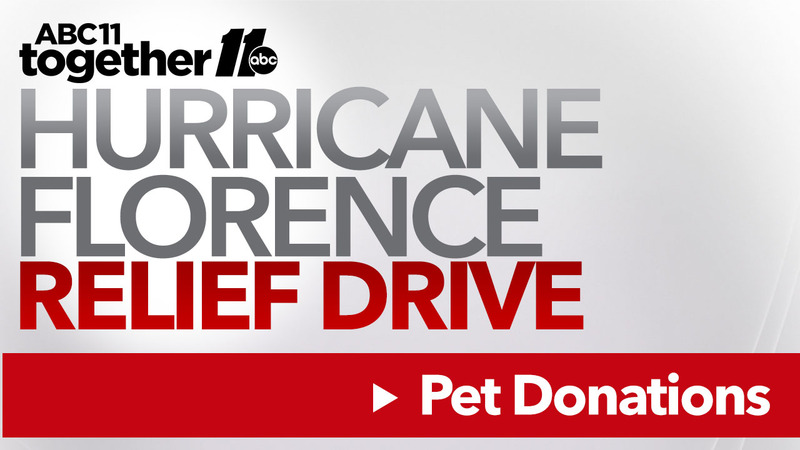 Donations for animals displaced by Hurricane Florence are being accepted at the North Carolina State Fair Grounds located at 1025 Blue Ridge Boulevard in Raleigh. In a Facebook post, Peak Lab Rescue announced they were in need of volunteers and donations for the affected animals. A few of the animals were rescued from the shelter shortly after Florence hit; however, an unknown number of pets remain. On Sunday, Triangle residents steadily arrived at the Holshouser Building located at the N.C. State Fairgrounds to donate items for pets. Those items included large crates, paper towels, dog food, leashes, doggy beds, and other items. Cat donations are being accepted at Dorton Arena. Peak Lab Rescue is continuously updating its Facebook page with information on what items are needed. You must be 21 years old to sign up. The group said they will remain at the fairgrounds until at least Wednesday. There is an event using the same building later this week. As of now, no information is available on foster opportunities.